I started this review three times. 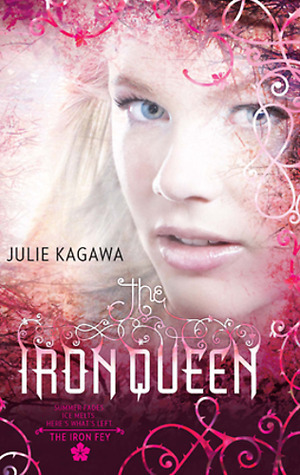 After finishing The Iron Queen, I thought about just giving it a rating and being done with it. After all, I had finally decided to stop thinking about the book and just reading it. And honestly, while I managed to enjoy parts of the book, there were still too many factors keeping me from fulling liking the book as a whole. The Iron Fey world is still as magical and exhilarating as it had started off from The Iron King. The ideas, the creations, the obstacles... all of it in adventure form was lots of fun. Because, as I'd said before: I DO love me some adventure. And adventure there was plenty of in this third installment of The Iron Fey series. And so I couldn't drop the stars too much since the ratings kept sliding back and forth until I finally just settled on a rather neutral area. I didn't entirely like this book, but I didn't entirely hate it either. But I DID get caught up in more parts than I got turned off by, so there you have it. In the first book, Meghan had her chance at growth and she got to a good point where it was acceptable, even if not ideal by the end of the book. But in the second book, it was like she just completely backtracked and then picked up about fifty other personality flaws while she was at it, only to end off the second book by developing back to square one where we'd left her at the end of the first book. If I could pretend that the entire second book didn't happen, then I might be a much happier reader. But I can't, and so that's why we've got the history of Meghan's journey hanging over our heads while reading the third book. Nonetheless, I appreciate the development that Meghan finally goes through, and were this not the THIRD book in the series, I might have liked the book a whole lot more, merely for the fact that, everything that happened in this book, I sort of kind of wished that it had happened throughout the three books -- even a lot of the romance. Meghan's self-absorbed behavior gets set aside as more important things start to happen, although at the beginning of the book, I felt she was a little harsh on Puck. She still tended to get all loud and dramatic at the most insignificant things. And, honestly, sure she's a bit more badass with the fighting and the glamour and the finally picking up a backbone thing... But Meghan was still a bit stupid and still a bit slow on the uptake. So... while she DID finally grow on me, I'm not quite going to be classifying her under my list of well-liked female characters any time soon. Coming to the romance, if Ash and Meghan had had a stronger supportive relationship history, I would be a hundred percent behind their love. Because it was written rather well and kind of touching in this book. But it was hard for me to separate the feel of the romance's premature beginnings from the first two books (and the mopey, angsty, oh-my-god-stop-whining-and-crying-about-your-shallow-love relationship from book two), from the more emotional, more agreeable, and much more heart-warming love between Ash and Meghan displayed in this third book. There's nothing left to say about this book. Adventures happen, magic happens, stuff happens... the characters were flatter than ever before, and I got through it. I realize that I am a minority in a sea of Iron Fey worshippers here. So maybe this series isn't really for me. I'm currently contemplating whether or not I want to start reading The Iron Knight since the synopsis seems pretty straight forward. I have about a week and half left before I have to return all these books to the library, so maybe I'll just see how far I get. Or, maybe I'll just have to come back to it another day after I've padded myself with some other books in between.